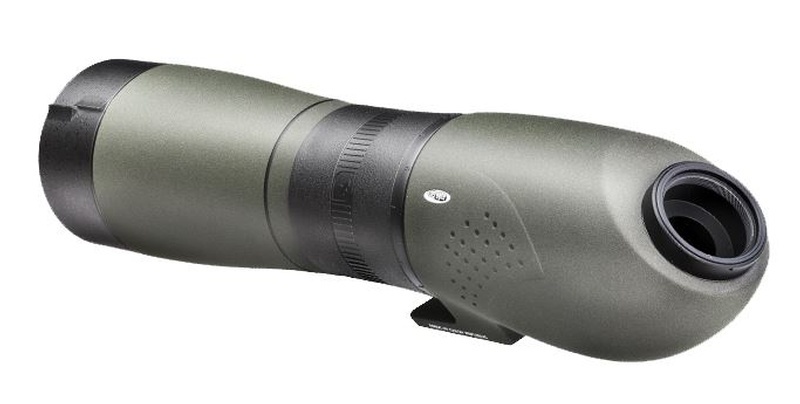 The Meopta S1 S75 75mm APO Spotting Scope is a high-quality nitrogen filled waterproof and fogproof spotting scope that features an Angled Viewing design. Also available with angled viewing but which one should be used is entirely a personal preference which cannot be determined except from experience. Straight scopes are simpler to use particularly when locating the subject and shave a bit off of the weight size and cost. The APO design of this spotting scope reduces secondary color aberration and assures brilliant crystal clear images under even the most difficult light conditions. Ideally suited for taking long distance photos. The 75mm size lets in a high degree of light allowing for use of higher magnifications in poorer light than with the 65mm version. Understandably it is larger heavier and more expensive but if you're not frequently hiking with your scope it is likely worth the expense and mass. Meopta spotting scopes are designed for the Natureviewer Birdwatcher Hunter and Target Shooter who demands a compact lightweight waterproof instrument with the highest levels of light transmission and definition. • APO optical design for excellent contrast and resolution. • Rugged outer body compositions include lightweight aluminum alloy. • Meobright fully multi-coated premium grade fluorite and non-fluorite glass objective lenses. • The built-in lens hood features an aiming element that can be used for quick general aiming. • The optional photo-adapter allows the spotting scope to be used as an 800mm telephoto lens which will work with most SLR cameras. • Rapid focus focusing wheel allows for rapid focusing from 13.8' (4.2 m) to infinity. • Compact tripod mount with 1/4"-20 thread. Purchase through PayPal by using the "Add To Cart" button above or use the form below to order the Meopta Meostar S1-75 APO Angled Body only . Feel free to contact us if you have any questions about the Meopta Meostar S1-75 APO Angled Body only .